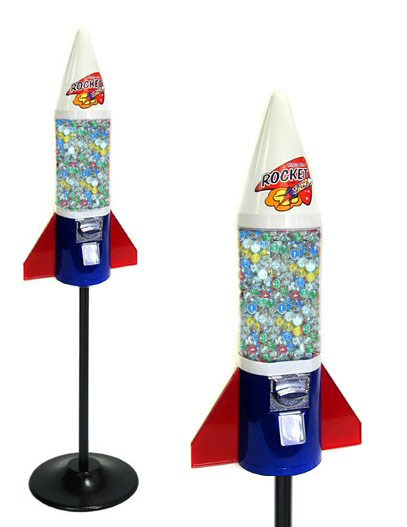 Blast off into space age profits with our patriotic red, white & blue, all metal construction, virtually indestructible Rocket Vending Machine. Mix and Match - Select any two Sqwishland Vending Capsule Bags (250 ct. each) above. With the Sqwishland Mini Rocket Machine Package - Mix and Match, you have your choice of any two of the following: 1" Sea Mania Vending Capsules with display card, 1" Sea Mania 2 Vending Capsules with display card, 1" Pet Friends Vending Capsules with display card, 1" Pet Friends 2 Vending Capsules with display card, 1" Jungle Mania Vending Capsules with display card, and the new 1" Sqwishland Barnyard Vending Capsules with display card. Eye catching machine mounted on stand. Commercial grade quality for years of use. Fun for kids, adults and all fans of outer space.